Easy-to-sing, with flowing melodies, these songs drawn from the Scripture readings and the ritual texts are ideal for liturgy. 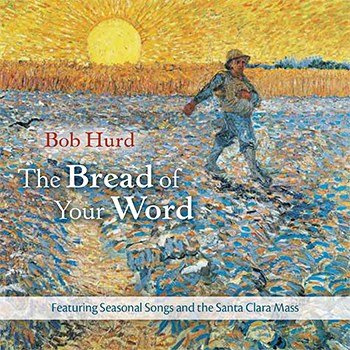 This latest offering from veteran composer Bob Hurd includes eight songs for Advent, Lent, Holy Thursday, Easter season and Ordinary Time as well as the complete Santa Clara Mass. With songs that flow wonderfully like gentle streams, The Bread of Your Word offers music with a cohesive quality in terms of both melody and text. The melodies are easy to sing, moving gently in a way that will allow any choir or assembly to quickly pick them up and bring them to life at Mass. The texts are drawn from the Scripture readings that appear on Sundays throughout the liturgical year and the ritual texts of the Mass—both sources of God's word and the nourishment it provides. Musical styles range from Celtic folk and rock to chant and more traditional keyboard-based liturgical music. Featuring Uilleann pipes and the penny whistle, "Every Creature Is Sister and Brother" offers a succinct summary of Pope Francis' Laudato Si': On Care for Our Common Home, filling a pressing need in our liturgical repertoire for music that speaks to our responsibility to the earth and its care. For those parishes that are ready to consider a new Mass setting, Santa Clara Mass might well be just what they're looking for. Bob's settings of the various parts of the Mass can be accompanied equally well with piano or guitar (or both!). The lovely melodic theme will make a memorable companion for parishioners as they are sure to find themselves humming it throughout the week. Perfect for simply listening to or for learning a new song for liturgy, this MP3 Album provides recordings for all the songs, as well as the Santa Clara Mass from Bob Hurd's The Bread of Your Word.